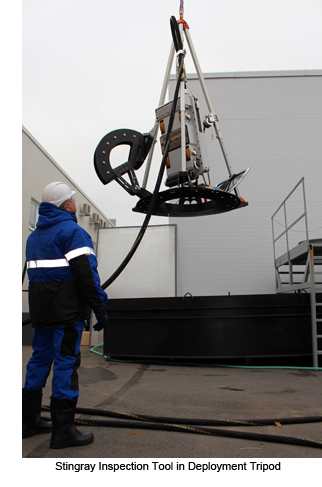 Comprehensive storage tank floor inspection services are provided by Diakont using a robotic crawler dubbed the Stingray, which can be safely deployed while the tanks remain filled and operational. Utilizing a patented combination of non-destructive examination (NDE) sensors housed within an explosion-proof enclosure, Stingray inspection systems supply complete inspection coverage, actually exceeding API 653 inspection requirements. Above-ground Storage Tank floor inspections are primarily driven by API 653 requirements. Traditional floor inspections are performed manually, requiring storage tanks to be taken out-of-service, cleaned, and degassed to allow workers to enter the confined space. These tank turnarounds create vapor clouds, create unique safety risks, and are extremely costly due to both prepping the tank for human occupation and the opportunity cost of being unavailable for use. Diakont provides comprehensive storage tank floor inspection services using a robotic crawler called the Stingray, which is safely deployed into above ground storage tanks while they remain filled and operational. Using a combination of non-destructive examination (NDE) sensors housed within an explosion-proof enclosure, Stingray inspection systems supply complete inspection coverage in accordance with API 653 requirements. Online tank floor inspections can be conducted more often than manual inspections which allows operators to prioritize tanks for turnarounds and extend inspection intervals through risk-based inspections. This inspection technology is also crucial for gaining information on newly-acquired assets with limited documentation. The Stingray system is a robotic crawler-type tool, connected to a control station with an umbilical cable. 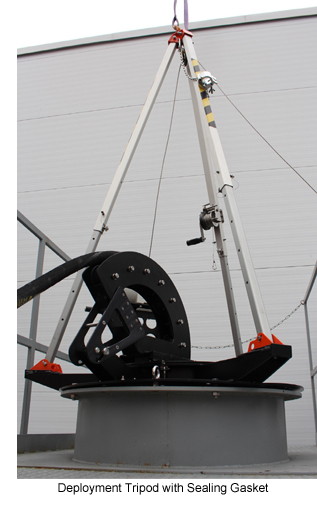 The robot and umbilical cable are purged and pressurized with dry nitrogen. The system is certified to operate in Class 1, Division 1 environments, where ignitable concentrations of flammable gas or vapors exist under normal operating conditions. Diakont’s Stingray inspection system is equipped with a patented suite of NDE sensors to assess the storage tank floor integrity. The Stingray provides the two complementary inspection methodologies of MFL and UT that can be run simultaneously. MFL is a robust sensor that can detect anomalies in almost any surface condition and the UT inspection has high accuracy measurement capabilities for characterizing any flaws detected. A higher confidence can also be obtained with detection by both NDE systems. Magnetic flux leakage (MFL) – The Stingray system is equipped with 64 Hall effect MFL sensors. This MFL system has a rotating magnetic assembly that facilitates turning off the magnetic field by cancellation. 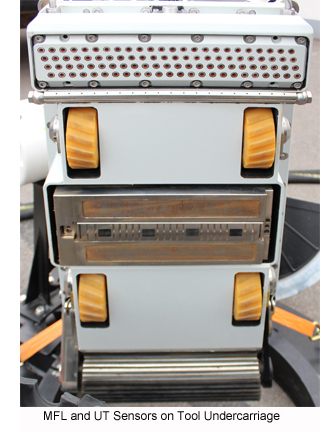 The Stingray is also equipped with 4 Eddy Current sensors that are used to measure liftoff of sensor housing. Ultrasonic testing (UT) – The Stingray system is outfitted with high accuracy UT sensors to measure floor thickness and assess anomaly size and depth. The UT module has 96 sensors positioned in an array of 4 staggered rows to provide 100% inspection coverage. In addition to measuring the floor plate thickness, the UT sensors are able to determine the thickness of any coating that may be present. The Stingray system is also equipped with 3D imaging sonar which performs XYZ scans of the tank floor to provide navigation and obstacle avoidance support when tank floor sediment prevents the onboard cameras from receiving clear images. Once onsite at the tank facility, Diakont technicians deploy a mobile diagnostic lab to a safe location near the storage tank. Technicians check all grounding, then power on the equipment on the ground for a complete function test and calibration. 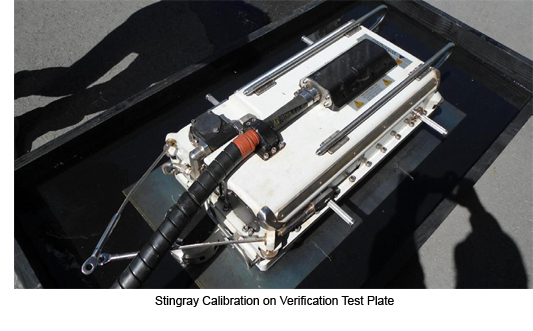 To verify the Stingray NDE sensor calibration, Diakont technicians use a verification test plate of the same thickness as the storage tank floor (including built-in anomalies in accordance with API 653 standards). After verifying system functionality and sensor calibration, Diakont technicians load the Stingray tool into the deployment tripod. Diakont technicians use a crane to lift the deployment tripod and Stingray tool to the tank roof. Technicians remove the manway and take extra precautions to limit vapor release while lowering the Stingray into the tank. Diakont technicians lower the Stingray tool to the tank floor and configure the on-board sonar navigation. Diakont technicians then drive the Stingray tool to the edge of the first floor plate and scan the entire tank floor plate by plate. Each plate and the annular ring are scanned using MFL and UT, creating a comprehensive NDE map of the tank floor. Two Diakont technicians operate the Stingray system; a robot operator and an NDE technician. The NDE technician monitors the sensor data in real-time. If any large anomalies are discovered, the technicians can go back and rescan to characterize the defect on location.